I wanted to offer all of our users an update on Caffiend 1.3, our latest update. We have had the update submitted to Apple and awaiting their app review teams to clear us for release since late September. We had originally intended this update to coincide with the release of iPhones 6S and iOS9, so this long of a delay comes as a huge shock to us. Our 1.3 update is fairly substantial, so we are quite excited to get it into your hands. There isn’t much we have been able to learn thus far, but the review process for this update is taking much longer than usual. In the meantime, we have began work on Caffiend 1.4 and also have been addressing some holes in our drink database. Thanks to some reviews on the App Store and some email feedback from our users, we have added Costa Coffee drinks, a UK based company. We have also added drinks from Dunkin’ Donuts in the USA. We will be adding more drinks from some additional companies in the UK, including SSP, Caffé Nero, Wild Bean Café and Coffee Republic. We are planning on expanding our drink list throughout other European countries during the first half of 2016. Thanks for supporting us as we move forward with Caffiend. We are making some changes to information previously released, so I wanted to clarify this for users for Caffiend. We had previously mentioned that version 1.2 would be coming this Fall and would include some larger feature updates. That plan has not changed, but the version system has. Caffiend 1.2 is now scheduled to be released in mid-August. 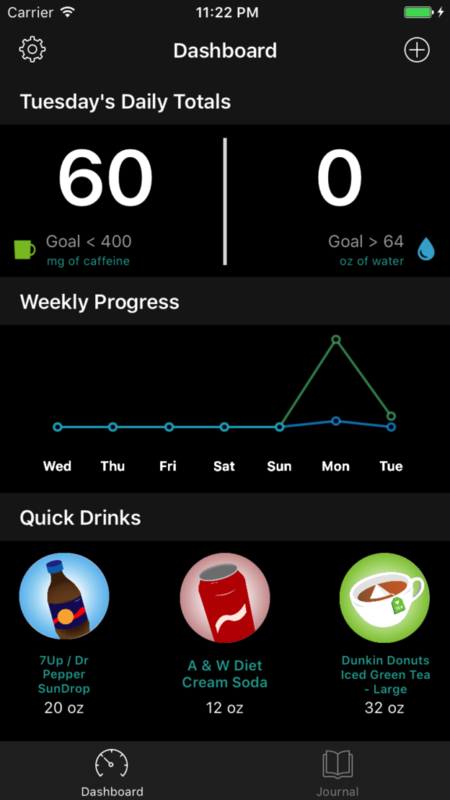 It features many optimizations and improvements, including a smaller install size, greatly improved search, another fix for the low res menu icons bug, improved updater, a new rating/feedback system, updated drinks, tweaked Watch app and UI improvements to the Journal and the Unit Preference panel. The features we had previously discussed for version 1.2 will now arrive in Caffiend 1.3, which will be released in Fall, where update 1.2 was previously scheduled for release. Caffiend 1.3 will be a larger release and include the fully redesigned Apple Watch app, iOS 9 improvements and other features we’ll discuss closer to release. Basically, our users will be getting an extra update, sooner, that will iron out some bugs, enhance your experience, and prepare the way for larger updates coming in the future. Thank you again for all of your support. • The Journal – The journal tracks all items you have entered into Caffiend and sorts them by day. This allows you to see at a glance how your caffeine consumption varies day to day. This also allows you to delete unwanted entires from Caffiend and the Health app. • mL support – Users in countries that use the mL standard instead of options can now choose which unit preference they want to use. This can be switched on demand. • Daily Reminder – Caffiend can now give you a notification at a time of your choice to enter Caffeine. This is useful if you forget to enter your caffeine, because the reminder will only hassle you if your daily intake is 0. • Bug fixes and more! We are now planning out the feature list for Caffiend 1.2, which we hope to release this Fall. That update, as promised previously, is going to have a major goal of adding functionality to Apple Watch. We are also aiming to adopt some new iOS 9 features in this release. Please let us know how you like the app, either by contacting us directly or by leaving a review on the App Store. Thank you again for your support. Caffiend 4th of July Giveaway! To celebrate the 4th of July (Independance Day) in the U.S., we are giving away four (4) copies of Caffiend for iOS. Just comment below and tell us what your favorite beverage is – caffeinated or not. We will randomly pick four winners from all comments on Monday, July 6th, 2015. Good luck! Winners will receive an iTunes voucher good for one free download of Caffiend – Caffeine Tracker. Posted in Caffiend, ContestTagged app, caffiend, contest, free, iOS, Win2 Comments on Caffiend 4th of July Giveaway!